What’s for your dinner tonight? Any mood for beef? 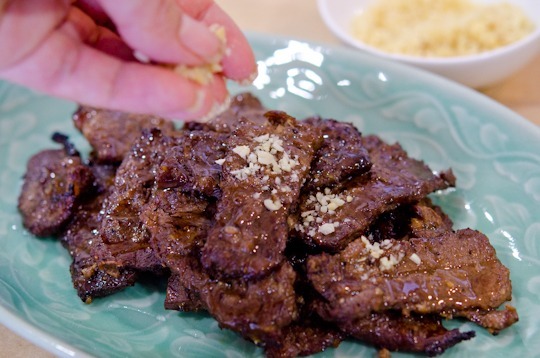 If you are, I humbly suggest to try this scrumptious old time Korean beef recipe. If I can add a comment on this dish…, this used to be served to the kings and queens in ancient Korea. 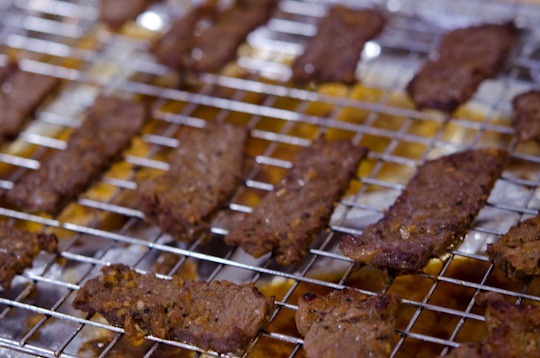 Perhaps Bulgogi was the most well known beef dish of Korea. But before Bulgoi, there was a dish called Mac-jeok, either beef or pork. 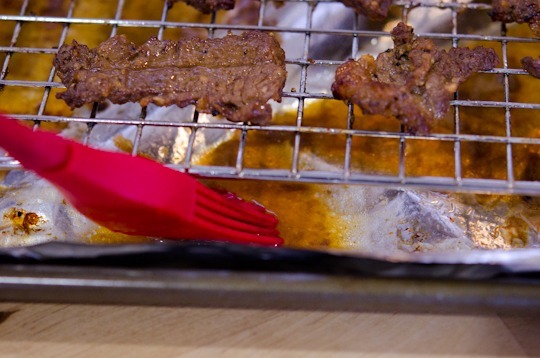 It was basically meat directly cooked over a fire, often using skewers. Historians believed that the cooking method of this dish was influenced by Mongolians, thanks to the Genghis Kan. However the beef was luxury protein to most commoners to access. They were mostly farmers and cows were the important asset they own. In addition to that, Buddhism was commonly practiced and killing cows were something that most people were hesitant to do, and didn’t know how to butcher properly. Therefore only the royals and the riches had enjoyed this dish. 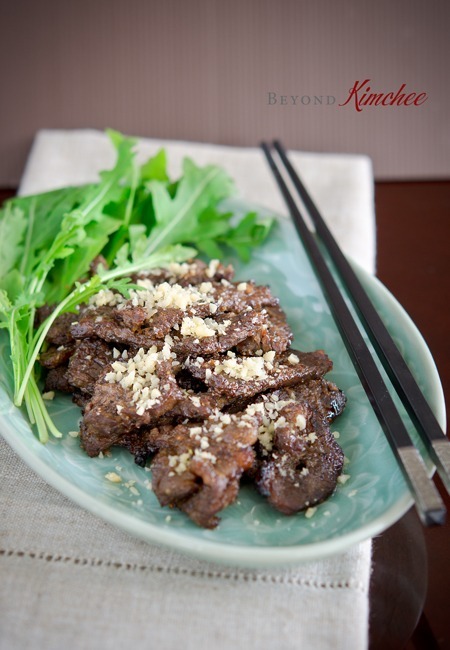 The bulgogi that we know is the modern method that has been evolved from this dish much later time. Now, I think I just gave you the Korean beef history 101 class. How was my lecture? 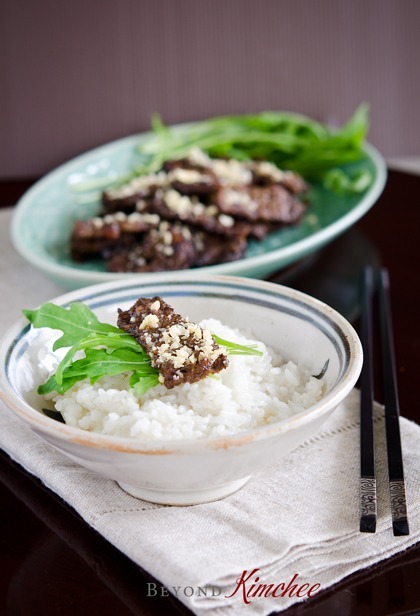 I guarantee that you will love this dish if you like Korean beef. It is quite easy and simple to make; easy enough to make for weeknight dinner, but fancy enough to entertain your guests. You can use outdoor grill but you will love how quick and easy to adapt this recipe using broiler function in your oven. 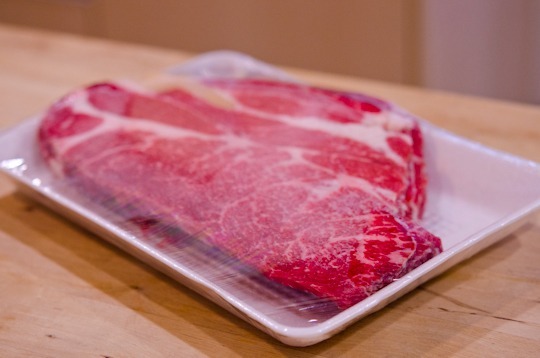 The best cut for this dish is strip loin or rib eye with good marbling. Ask your butcher to slice about 1/4″ thickness. 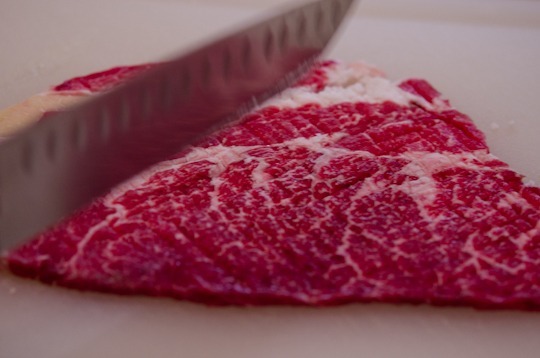 Pound your meat with back of your knife to tenderize the muscles. Poke here and there with the tip of your knife. 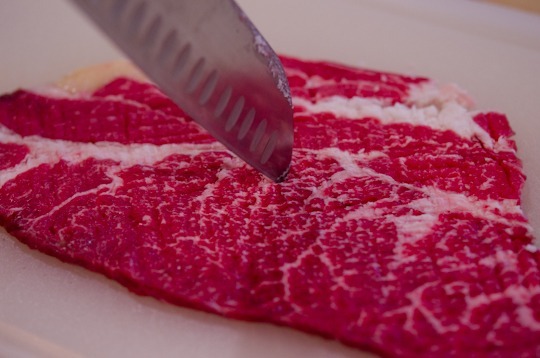 Slice your meat into 1 1/2″ x 2″ rectangular shape or any big bite size you desire. Now here are the glorious seasoning ingredients; from left to right. 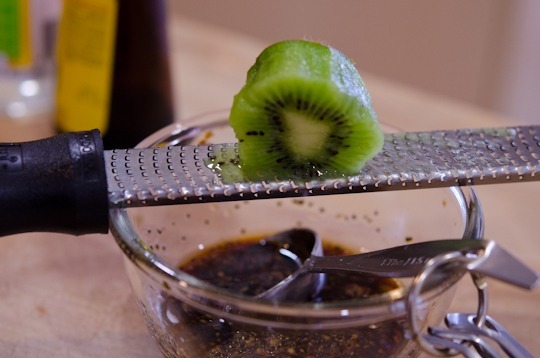 honey, rice wine, sou sauce, sesame oil, pepper, ginger, kiwi, and garlic. Add onion to the list. Traditionally Korean pear is used in most beef recipes, but I can’t get the winter fruit in this tropical land. Kiwi will work great since its acidity will dramatically break down the muscles. You will need just a little bit. Combine all the ingredients. Grate kiwi, ginger, and onion and add in. Spread the sauce evenly all over to the beef slices. Let them sit for 25-30 minutes on room temperature. 25 minutes feels like an eternity if you have to wait. Especially when you want to EAT! 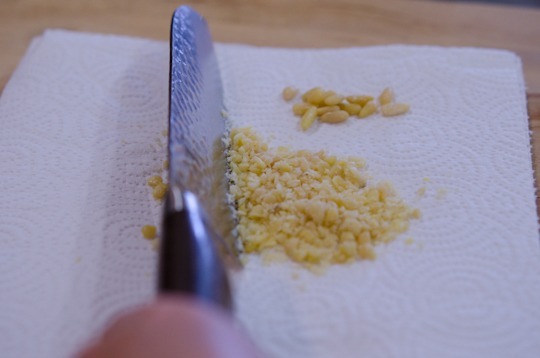 While waiting, chop some nuts finely. I recommend to use pine nuts but walnuts are okay, too. Time to broil the beef! 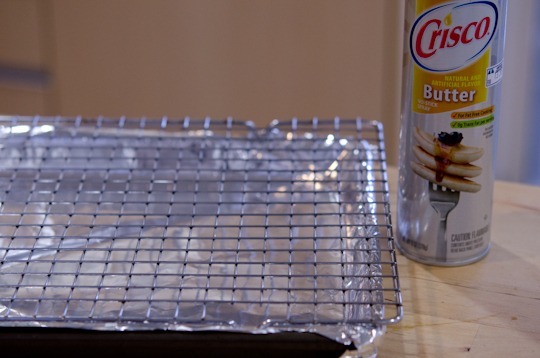 Place a cookie rack over a pan lined with foil (easy clean-up later on…). Grease the rack with a spray. 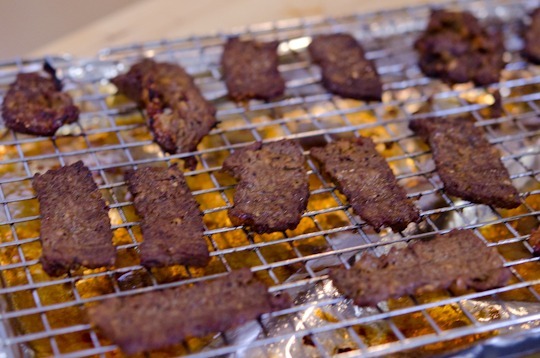 Place your meat slices on top of the cookie rack. Place under the preheated broiler about 4 inch below the heat source. Broil about 4 minutes. Watch carefully so you don’t burn them. They will come out like this. Flip to the other side, and continue to broil, about 3 minutes on the other side. Ooooooh! I was so ready to eat. I picked one and put in my mouth. Can’t find the right word to describe how good they are. I’m literally feeling my lack of English vocabulary skill. and brush over your meat. Gives nice shine and keep them moist. Present your meat on the prettiest platter your own and sprinkle with nuts. And enjoy with some lettuce, rice, and kimchi. Korean spinach, the rustic Korean spinach, bean sprout salad, or spicy cucumber salad would be very nice side dish to go with. Savor the dish that once was beloved in the palace of Korea. Hope your dinner would be as fantastic as mine. 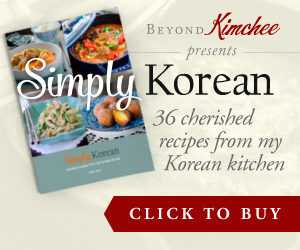 … sharing Korean meal from my kitchen to Yours. 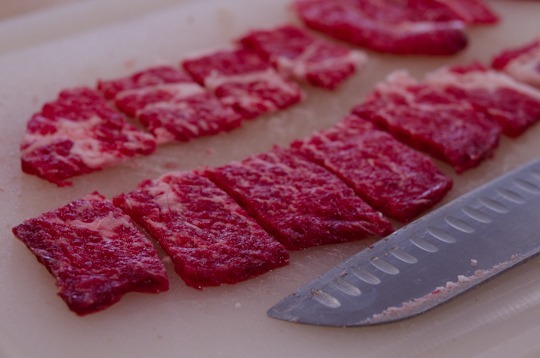 Pound your beef slices with back of your knife to different directions on both sides. Poke with the tip of knife here and there. Slice the meat into 1 1/2" x 2" rectangular pieces or any big bite size you desire. Spread the beef slices in a large platter. Set aside. 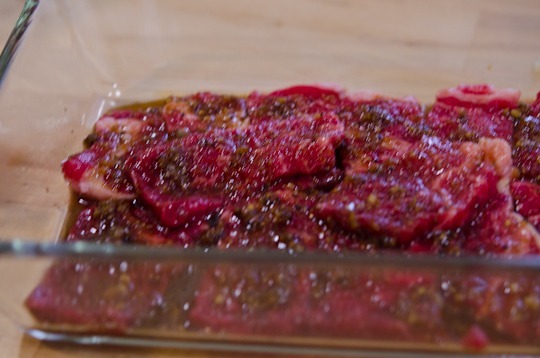 In a small mixing bowl mix all the marinade ingredients and spread it evenly over to the beef slices. Let it sit on the counter for 25-30 minutes. Preheat broiler. Place a cookie rack over a pan lined with foil. Grease the rack with spray. 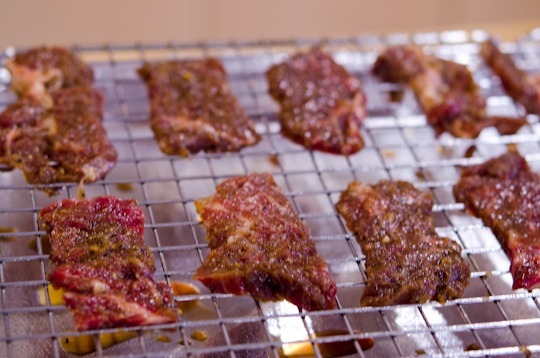 Spread the meat slices in a single layer over the rack and place under the broiler about 4" below the heat source. Broil for 4 minutes and flip. Broil the other side for 3 minutes. Watch carefully while broiling so that you don't burn the meat. You will see some juice in the pan. 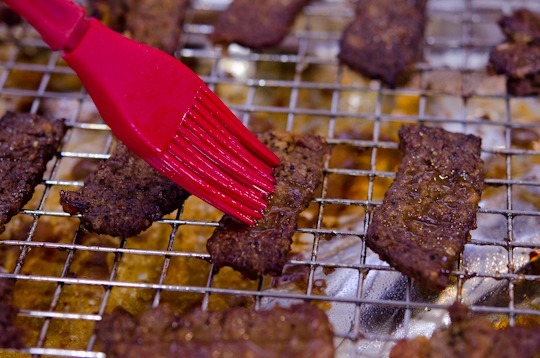 Brush the juice over the meat to keep moist. Present the meat on the serving platter and sprinkle chopped pine nuts on top. Serve warm wit rice and any vegetable side dishes. Thanks Swan! You are the best! Delicious! Both the recipe and the photos. Really good job - such great flavors. Love the photos with the silicone brush - how did we exist before they invented these? Such a great tool. Really nice post - thanks. Thanks Kitchenriffs. I love silicon brush. They are so easy to clean! 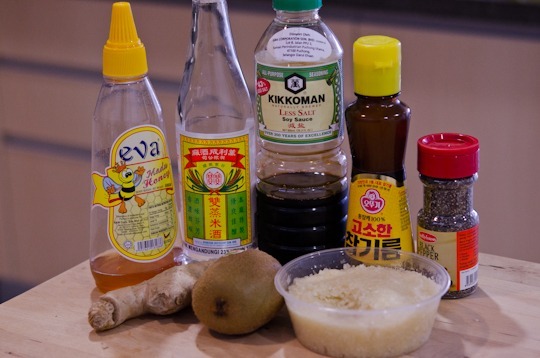 Yes, there are a lot more than Bibimbap or Galbi in Korean cuisine. I love your blog, especially the name! Thank you for the Korean beef history 101 class! It's awesome and good to learn something new, especially with food involved. ;) I love your recipe and presentation. The marbles on your beef is beautiful. Can't wait to try out your recipe. Thanks Amy. Hope you can give it a try soon. Thanks Nami. Nothing beats grilling when it comes to cook meat I think. 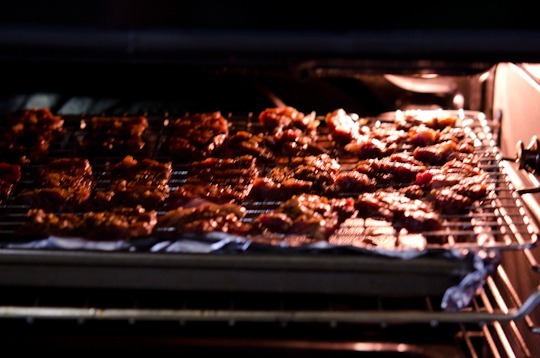 Broiling is a great adaptation to grilling. Hi Holly, This is a great recipe, I am so going to try this, thanks for sharing. Your photos are SO nice! I just had my dinner, but now feel hungry again because of your tempting photos!! Wow - this is a beauty. Savoring the marinade and bookmarking it. This truly does justice to a nice piece of beef. I love the bit history and storytelling that come with your recipes you make it so interesting. And your photos are GORGEOUS! I'm sure it's more due to your skill, but would you share what kind of camera you use? Hi Tumbleweed I use Nikon D7000. Thanks for the compliment. I love your blog and your recipes. 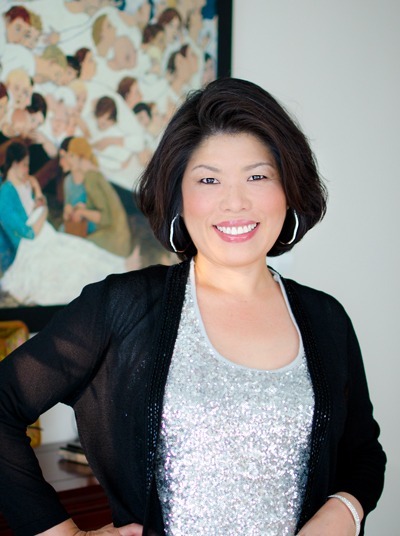 I learn from you- my mother is Korean and I have learned lots from her, too. You feel like a sister in some ways. Thank you for sharing what you know! Fabulous! Can't wait to try. Thanks for posting Holly, just looks so delicious! That looks good! I will have to try that recipe. My mother who was born and raised in Korea did/does not cook much so while I can whip up a lot of gourmet dishes, Korean food is not one of them. I'm so glad I found your website. :-). Thanks Jade. Hope you get to give this dish a try. It is quite nice. I made this for my family yesterday and everyone loved it. I love the technique used here otherwise I think the meat doesn't brown as well. Thank you! Hi Julie Every oven's broiler power is different. I had to reduce time to not to over brown mine. Maybe adjust the height of your rack or increase the time. I am glad to hear that your family liked it. This looks great; I can't wait to try it! With summer coming up do you have any suggestions for re-adapting this to outdoor grilling? I wouldn't cut the beef to small pieces at the beginning. Season the beef, grill, then cut into bite size pieces. If the beef is very thinly sliced, you will only need 2-3 minutes per side to cook. Hi Holly, I am grilling these glorious slices of beef on a cast iron grill pan on top of the stove. My family is in for a treat tonight. Thank you! I hope your family loved it. Thanks for the comment!